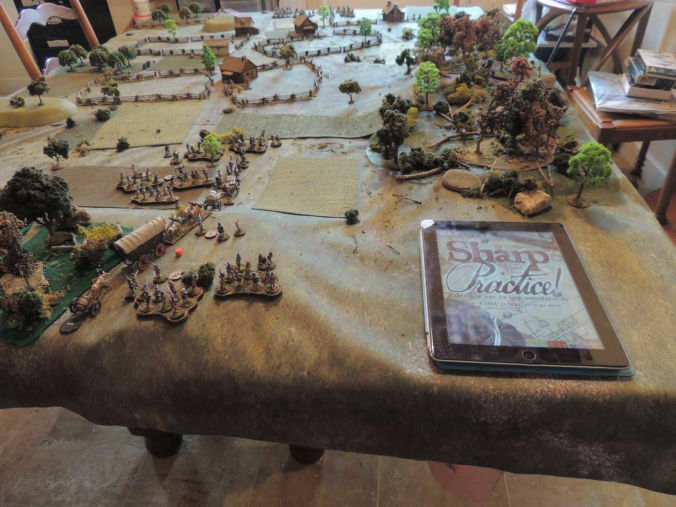 AAR Sharp Practice American war of independance. the 2Fat lardies REBEL CONVOY! Now a year after starting with this wonderful set of rules, I can give an AAR of an early game. Most of the recent one, too darn tense and happy to get proper pics and time to record the steps! But I will do more. Installing the thing; always best before the game players are there, if you might be hard pressed with time. 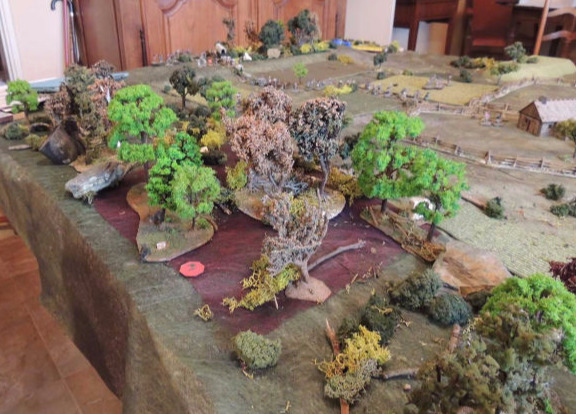 SP can be a smallish gem but most of the time, to be both more interesting and look right, it does need quite bit of "terrain"- detailing the table. Well I enjoy doing it and I do want good looking tables. This is an old one on ta temporary setting. 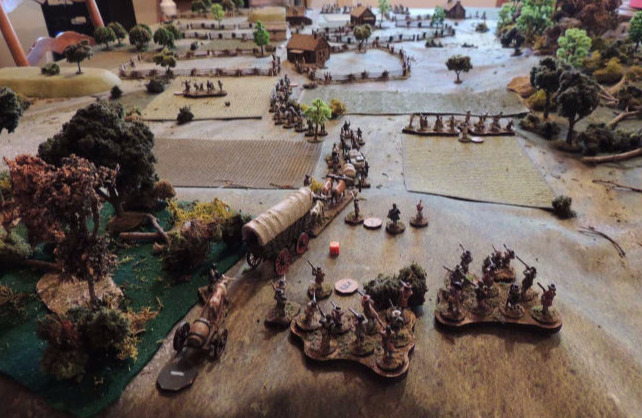 An imprumtu scenario for roughly 1777 between a Loyalist raid and a patriot/rebel militia force. Forces choice: (done with Sharpulator) the Cl2 for ex mean class2 level leader; all abreviations and game terms refer to Sharp practice2 rule. I assume that one miniature represents 2real men. In the case of commanders, a batman or as they can be replaced, their seconds. It suits ok the space they take on table. See house rules and why I do this. here we have nearly 120 ; real so yes it deserves a colonel. the primary deployment point: red roundel. The secondary waiting. 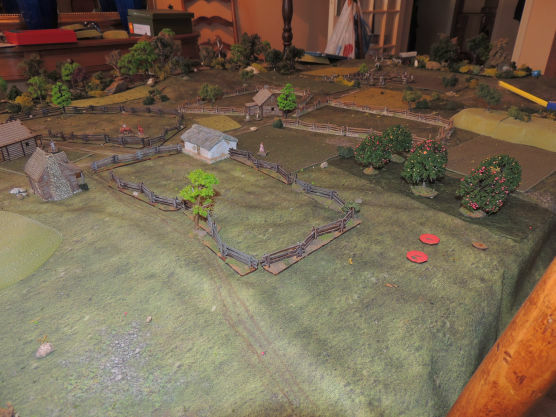 A road going through farmland using my rrady made mats. 190cmx 135cm. Farms, fences a crossroad, bordered with woods and orchards. Rebels have to set up. Two militia formations up front same at end of convoy..
Two groups of rifle irreg sk trying to check the woods. One group left flank security. Actually the convoy moved one move ahead of scouts here. To fit on table. Lucky tories now roll 1 for dep point. Ok in woods away from enemy. Second roll they can chose. Have mobile secondary. They put primary behind orchard on the left to use for the tory line to black the way. Mobile sec ( bought) ahead behind a house hoping can be moved in woods for the rangers. First card. Tory boss. 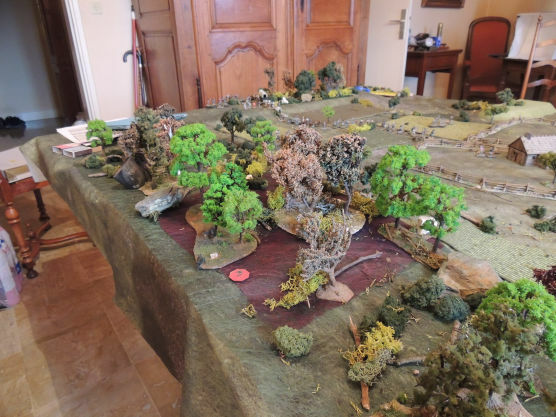 Deploys inf in column just behind orchard ready next go to deploy hopefully behind a fence ahead of yankee col. Good as a mob deploys one moves one house ahead towards the woods. Moveable Deployment Point sneaked behind cover.. waiting for cards! moves a bit away with tory boss card. Next card Leader 3 tory. Already moved with deployment. 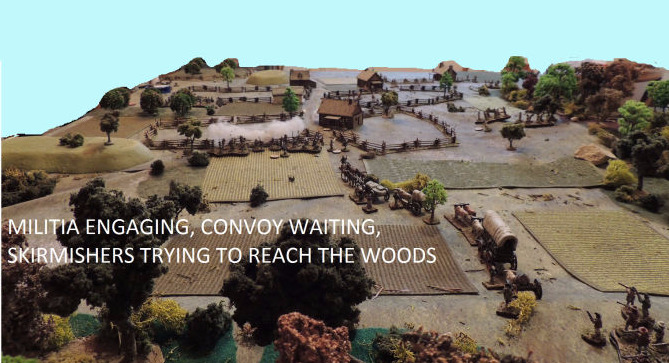 His second initiative to order forward the convoy. 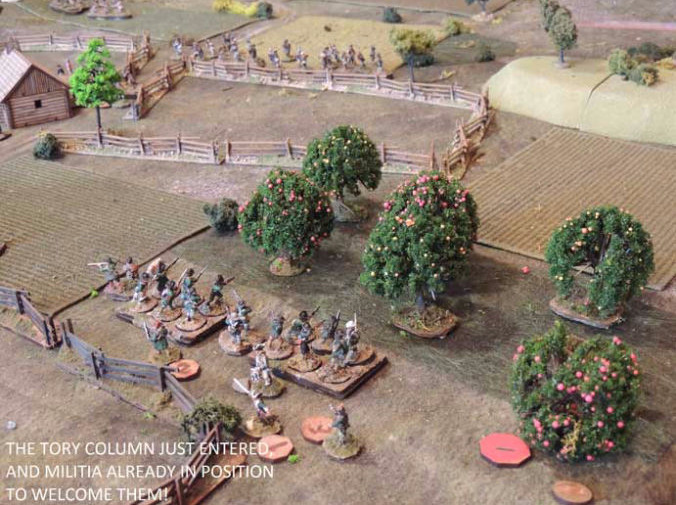 (I play as one fig = 2 which suits ok the space they take on table...) Goes 6 " left along fence, second action is for second platoon to form up on left. Then Tory 2 commander of line company. Already moved. Cards: command both sides. Now on, I will rarely write about the command cards when they show up, only when used. Of course in the decisions to use or not to use them, in their showing up at all, lies a lot of the game and each side possibilities (which I might have missed!). Patriot 3 already moved with convoy (column move) . Patriot 2 militia 1st company commander, Already acted in formation. 2 groups. First moves 6” second 8” but stays alongside the first. Hopes to go right in woods to deny tory deployment. Waste. All groups have acted. Note rangers are not yet in. then ranger unit deploys, then TIFFIN! Line first fire. Long range, most of the target seen through orchard so will count as light cover. But 20 men plus leader 2 plus first fire, target in column, 22 dice, 4+ to hit. Then reload. 12 hits! 2 dead, (or wounded) 4 shocks. And major Pommy-long is hit. Roll 2 knocked over, over might recover. Minus one force morale. Reb have one command. Activate sk to house. Reb leader one again! Fire at will! 3 hits one shock, obviously the smoke from the first volley had not cleared enough. Last was firing. Fouled barrels in house. (farm must have a well hey? Out of despair can use bottle of moonshine.). -1 until then. Possibly only those who already shot. Reb has now 4 command cards!. Will reshoot will militia: 7 hits.2 killed. 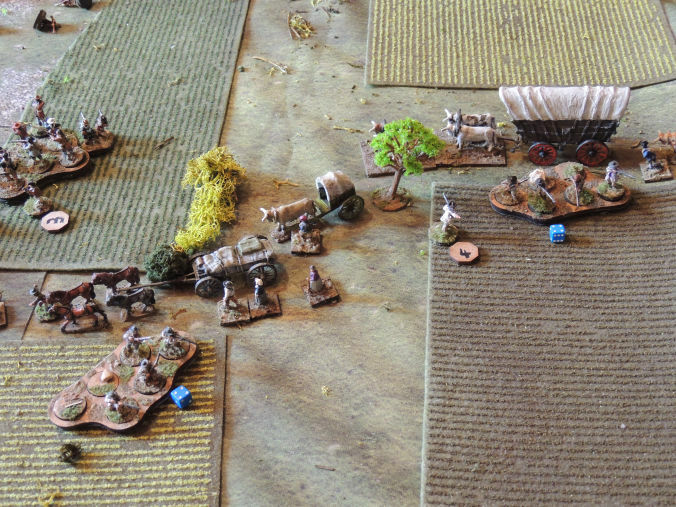 Reb command and again then leader 6 unfouls muskets. And reloads waiting. Consider last firing. Remove one shock. None there so shouting enthusiastic insult to tories. 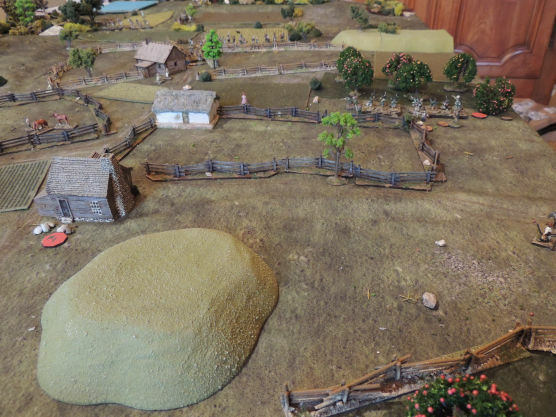 Cannot move second point from behind farm as would be seen from sk. I assume we could, after all it is not coming from him but the guys already moving in cover. Tory 4: Late rangers, and not where expected. Too greedy. I have to put them behind the woods too far from the hoped for flank of the convoy. Tiffin. Both have two cd cards. 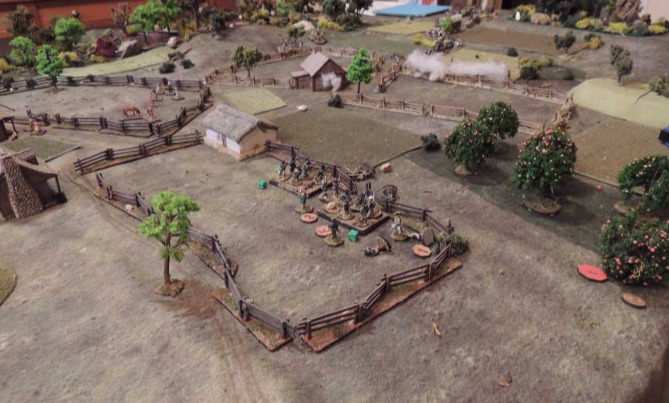 Reb move the rifles. Low dice. Reluctant! Leader 3 tory sergeant: off one shock. Leader 4 reb rifles forward. Hoping for high point in woods. Leader 4 rangers ahead in woods . Hope to chase rifles and turn the rebels. 2 init, can activate the first 2 groups. Reb 6 reshoots from house. No hit... As usual. 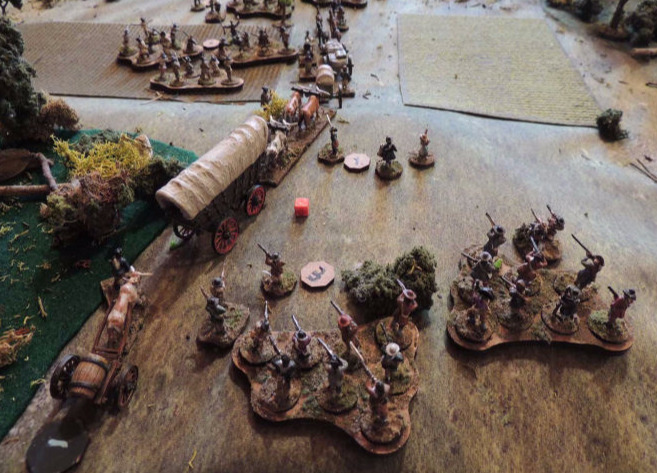 Reb leader 3 rushes ahead of wagons. 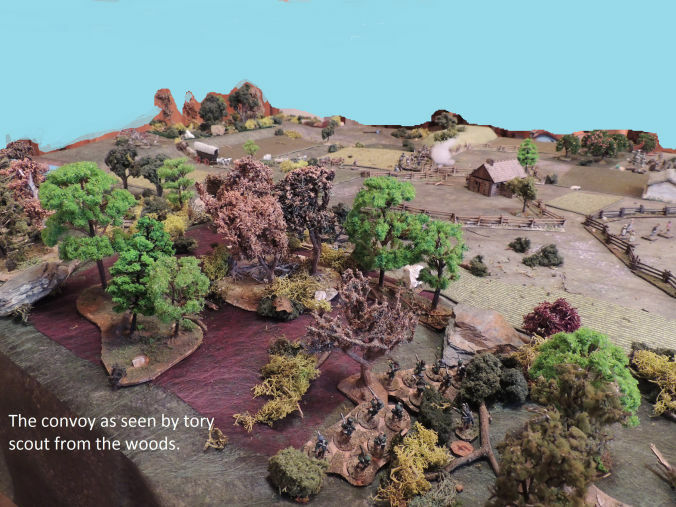 Far right lurking in and behind the wood, the late rangers; left engagement between tory line and 1st militia company (smoke). 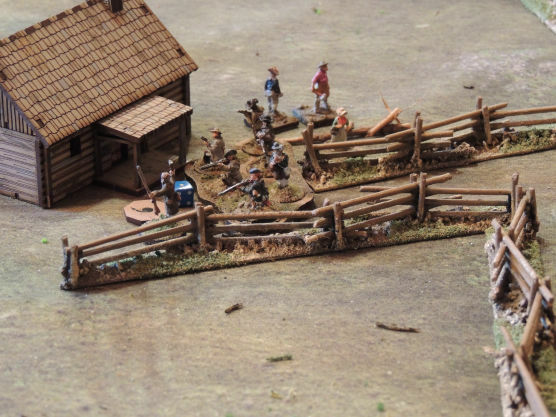 The rifles are trying on the right between fences and wood; second militia company still behind convoy; late (for the ones in front; safeguarding the rear in case, for their report). Leader 1 reb. Fires line, moves convoy. Lots of noise, obviously now smoke: paltry 3 hits one shock! 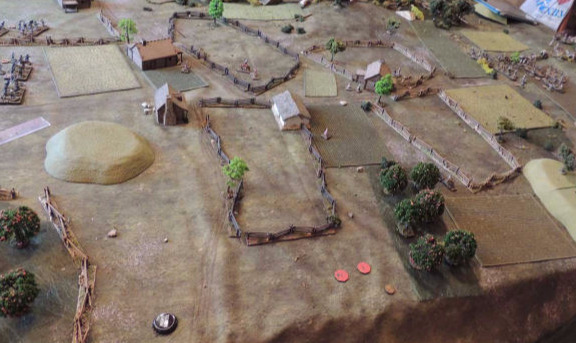 Third ranger group moves ahead in woods. 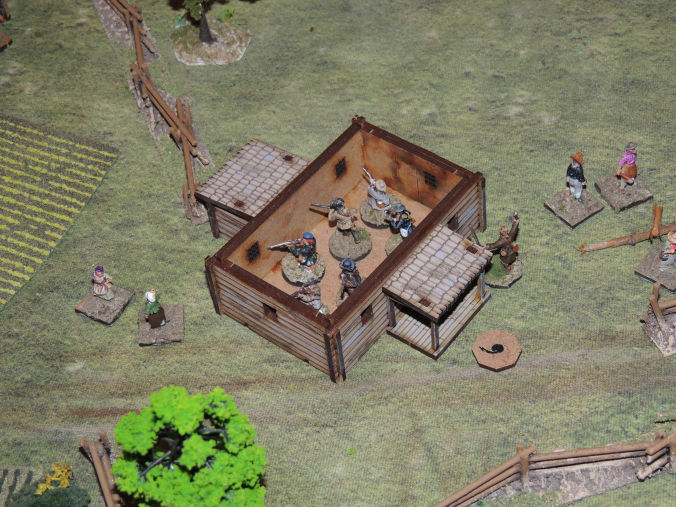 Reb 4 rifles now thinks it is not good in close combat with the lurking rangers. Back! Run! 2 groups, 2 activations one shock each for the run. Sk in house, leader 6. Well as usual. Second reb militia company. 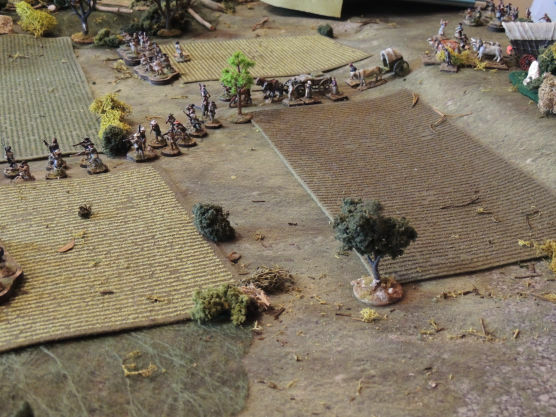 To cover right flank; move. 3 on two dice. Lots of noise and confusion ahead... Maybe we can let 1st coy finish? Both sides have 3 cd cards. Only use for tory who finally activates capt Pinball #2. 6”! -2 shocks to go over fence and deploy! Off one shock. Second initiative spent. Tory 3 off one shock. Reshapes the line. Rebel capt looks towards colonel waiting? 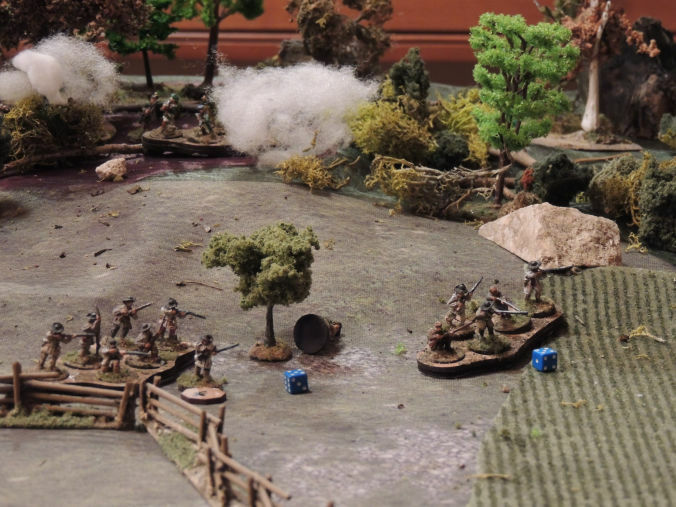 Leader 4 ranger capt rushes to flank the Americans. Leader 2 tory finally shoot! Adds one card. 3 init , present fire reload! 4+ to hit 12 dice plus his 2. 8 hits, tory vengeance. One dead 4 shocks. Cards. Us 3 hopes for 4... But tiffin. Activated militia who returns fire. One dead. Brit with 2 cards can move last ranger but no. As leader would stay behind? Reb 2: off 2 shocks. Tory 2 plus one card desultory fire one shock. Tory line sgt takes off one shock. Event. Building within 12 none. Leader 6 sk reb: 2 guys to fire from another window on far away rangers plus front. Well you know the result. Now both sides have 4 cd cards! Leader 3 reb (second company). Re activated; edges forward. 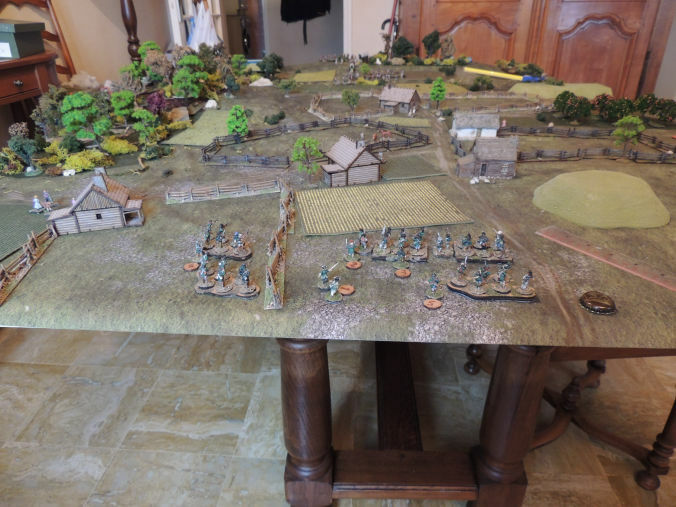 Brit activates late ranger platoon. Reb 1 fire. One shock off. Nothing. Rifle capt. Off one shock each. Trying to rally them forward. Pommy still off. Leader1 tory card. Ranger capt fire and reloads. 3 dead one shock. 7 hits on left group, more shock than guys. Withdraws putting force morale to 9. Rifle leftenant escapes whistling bullets. In the house, explaining the locals no harm will be done. 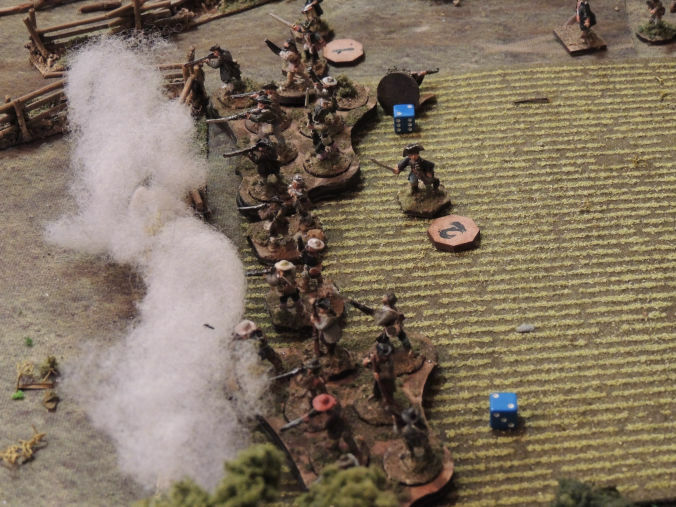 Reb 2nd militia coy shakes up in line. Then event: march column. Irrelevant; just about! Leader 2 takes off both shocks from his militia coy. 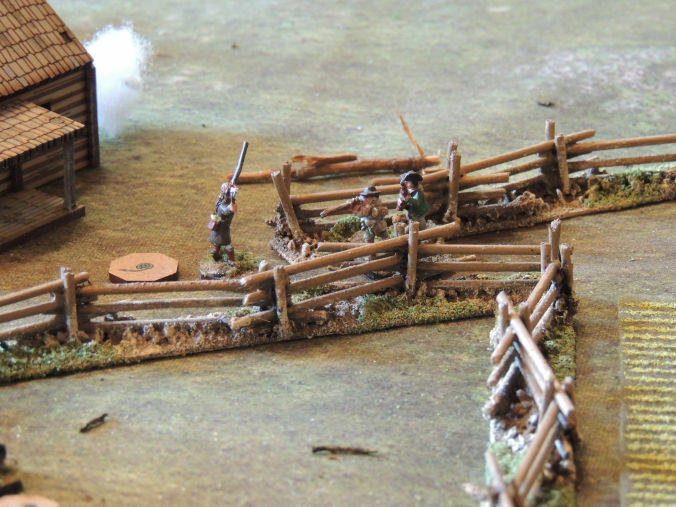 Ranger capt fires to finish the rifles! Use one card to add. 8 hits 6 shock. Rifle lt still ok.
-2 force morale to 7! 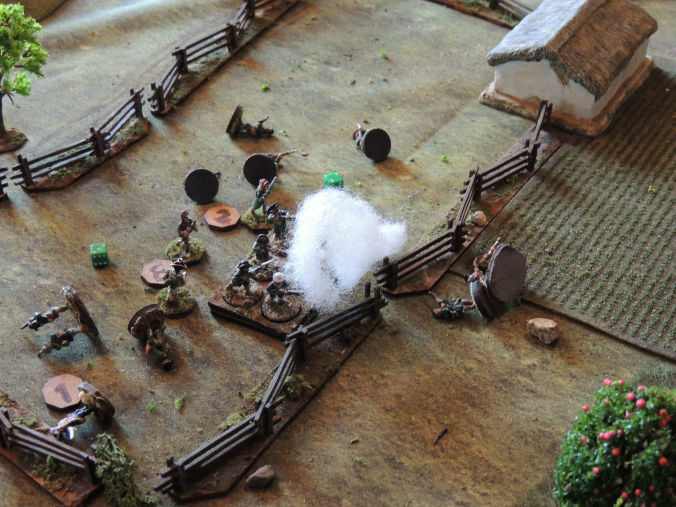 Rifle lt. Moves his platoon (other one out of reach) out of the way. 8" no reduction as they are happily getting out of range! Reb colonel looks back. Oh my god get those rifles back. Uses all 3 cards. Init 5 one to keep his line shooting, 4 to skake up the passing rifles. Only one shock on tory line. House sk? Yes. They found something more interesting? Tiffin. 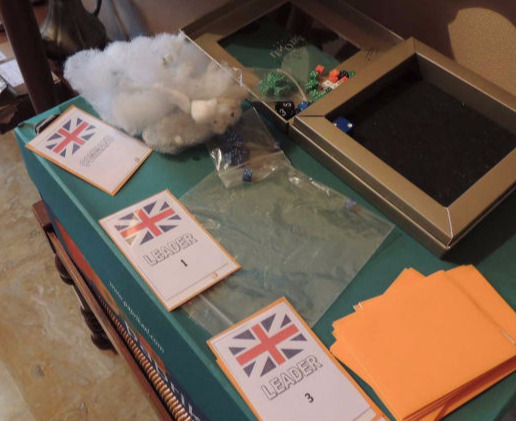 3 card brit activates tory line. one shock. Civilians in convoy, protest as they are now within range of rangers! Leader 2 reb. Shock off. Leader 6 reb what to expect? Leader2 tory line: fire no hits. Reb 4, rifle captain, 2 shocks off rifle shaken; no longer broken. Reb 1: forward to other fence. Has to go to change the stalemate. He has19 guys vs 11, maybe. Breaks formation and 2 shock for disorganisation crossing fence. They don’t reach the next one. Reb 3 edges off left to reach fence. 2 to dice, moving. Hello ladies. 2 militiamen are deeply convinced of the unfairness of life, that in the house nearby, the poor firing of the sk is due to their pressing activities with several amazing ladies and they rush in to have a share. 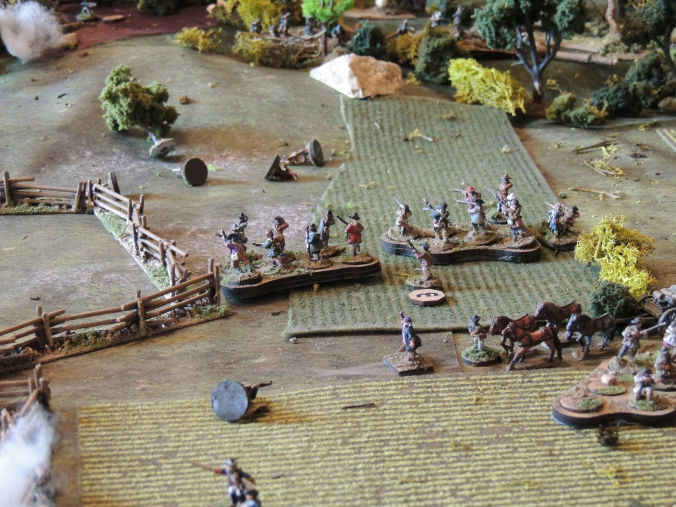 Tory ranger capt moves left to get out of the fire angle of militia line. Tory 1 Pommy-Long finally gets up. Orders a crashing volley on closest militia group. Still long-range!.. Nothing. Costs 3 command cards! Tory 5 moves 3 ones! Ranger lieutenant obviously very cautious. Tiffin. 3 cards. Second rifle grp gets closer to leader. Reb 3, second company, still edging towards fence, eying rangers. 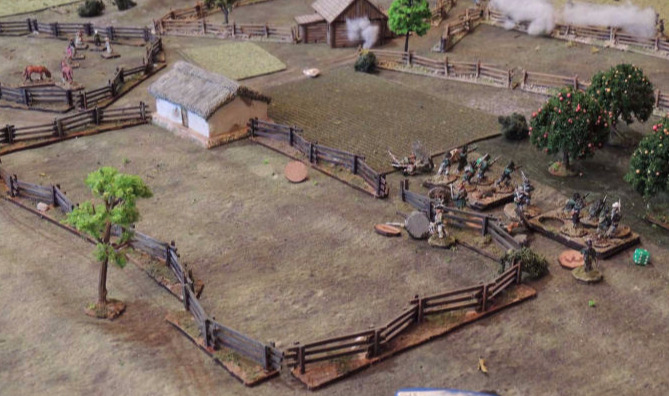 Reb cards allow militia to reach fence. And lost ranger to move. 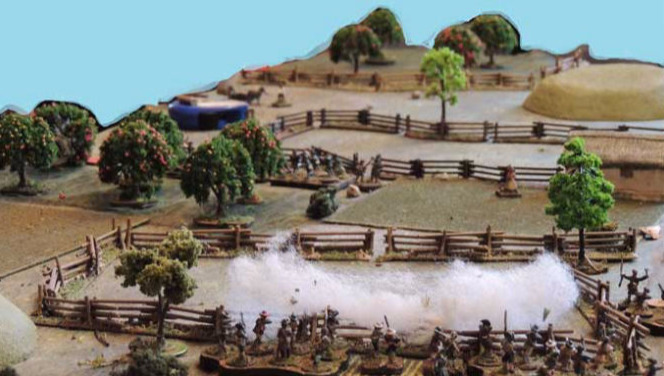 Reb 4: 2 shocks off rifles. 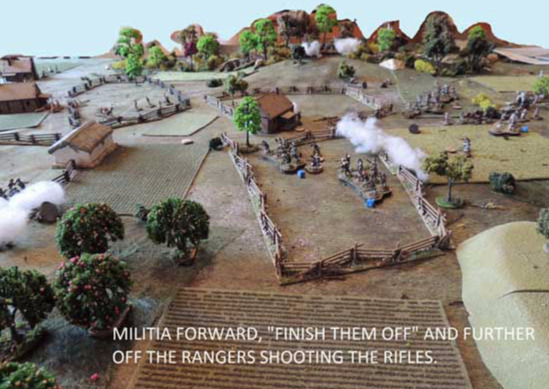 Reb 2 formation for militia, 1st company and reload. Tory 1 fire: only 3 hits (out of 14 dice!) with 4+ one killed. Reb 3 change angle; forget the fence. Rifle capt rallying one shock each. 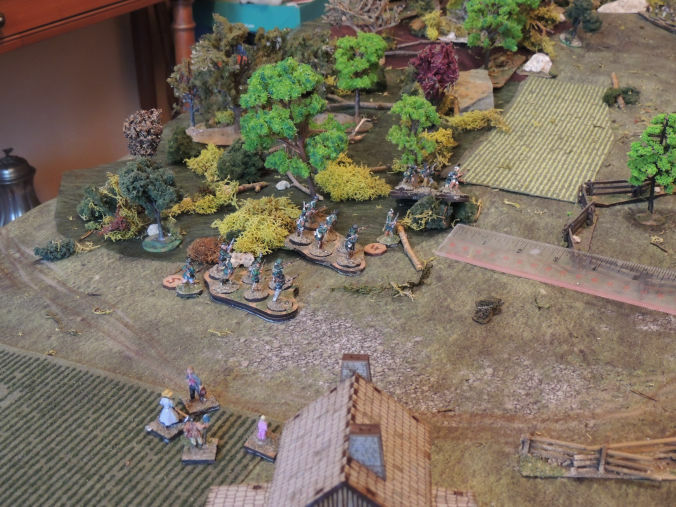 Reb col orders crashing volley from reformed militia. Has 3 cards. 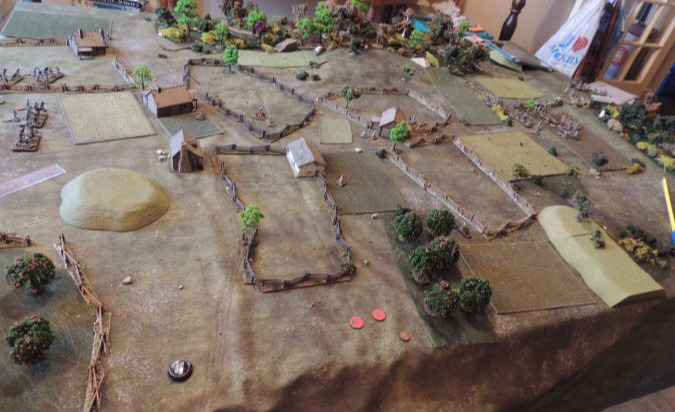 18 men plus own capt attached 20 dice; One killed and 3 then 6 shock (doubled for crashing volley). Tory line capt reduces 2 shock. 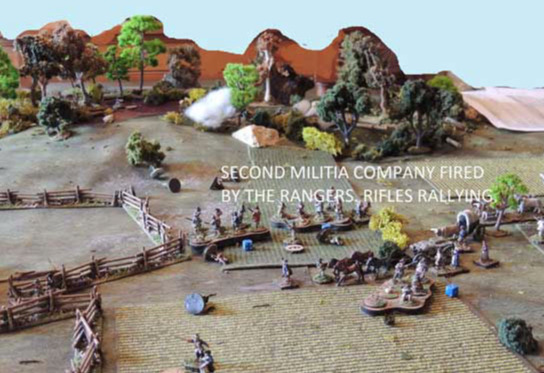 Ranger capt fires on second militia company Plus 2 cards. : 9 hits. 2 dead, 4 shock. Event firing 6 but rangers had no shock. Left militia 1st company 2 off one shock. Reb 4 off two shocks. Reb 2 fire + one card. 21 dice. 12 hits! Devastating 4 killed 2 shocks. Pommy is hit again. Killed. Minus two force morale now 8 for loyalists, 7 for reb. Tory 2 regroups one shock off last stand? 6 men left out of 16! Event 6 last firing? Exuberant vengeful militia off two shock. Diehard sgt off one shock on tory stand. Reb col one last salvo off +one card. 11 hits 3 dead! 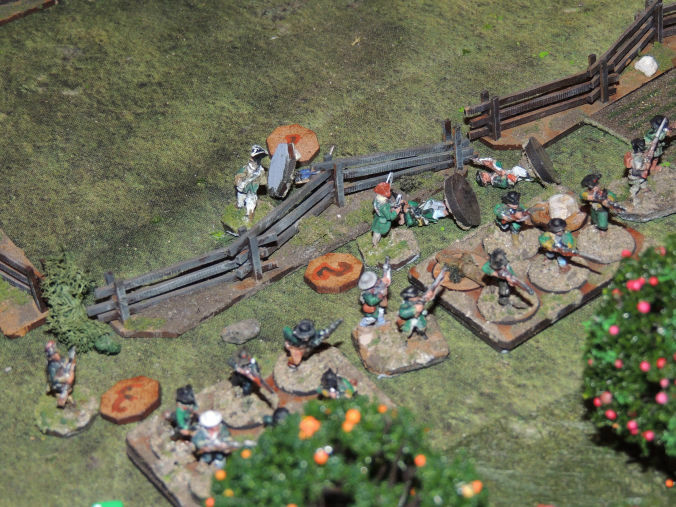 5 shock both capt and srgt wounded 0 and 1 level 3 men left. Sgt well liked -1 force morale same for capt break, now force morale is down to 5. Tory 5 shoots: one shock. That won’t change things now. Tory 4 shoots. 14 dice one shock only. Call it a day? Only 3 rangers groups left, none of the Patriot groups are any close to running. Of 18 figures vs 50! pic the convoy among the routers, trodding towards the exit.